After a fruitful cycle in the Post-Master’s programme at the Atelier National de Recherche Typographique (ANRT) in Nancy, France, I am starting to divulge both the theoretical and practical results of this research. My project regarded the creation of Paideuma, a multiform typeface family which attempts to retrace, through typeface design, the stages of modernity in Brazilian arts and literature, from the colonial period to the second half of the twentieth century. 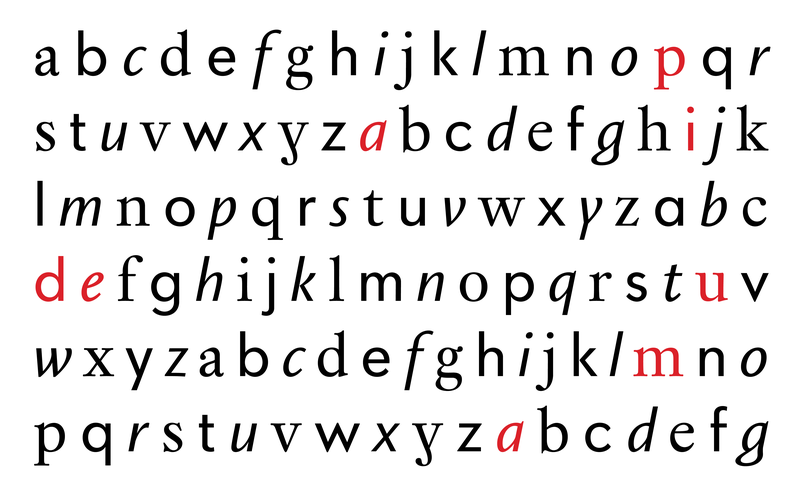 The family is declined in three formal and historical interconnected styles: Baroque (a serif design inspired by European types from the same period), Concretist (a geometric sans) and Tropicalist (a hybrid italic that can be used in combination with the two other designs. The reflection on practice dissertation, which documents the then current state of the project (June 2015) is available for viewing and consultation on this website. In a matter of days, an improved version of the typeface family will debut through the typesetting of Impossível como nunca ter tido um rosto, Brazilian poet Ricardo Aleixo’s next book, whose editorial design, signed by myself, explicit some of the various functional and expressive attributes of this typographic system. The book launch party will take place on November 14th. Very soon I will disclose in this website further details of this event, as well as the manners by which the book can be purchased. The intention is that the typeface family “grows up in public”. I hope that by doing so, as the types are used in graphic design work over the time, we will be able to testify an organic improvement which will culminate in the much anticipated commercial diffusion of the typeface family. In order to help (meta)writing this story, I invite all of those who “[shepherd] words and books on their lethal and innocent ways” (Bringhurst) to contact me for more information as to how to use Paideuma in your projects. Let poetry remain “the unique source”!